AFL post-season: Who is ready for a superdraft? Team not playing in September, or not anymore? Tired of all the talk about Thursday night finals, and ticketing stuff ups, and (weirdly) the AFL’s involvement in the child minding arrangements of the South Australian squattocracy? Who can blame you! For those of us whose team has dropped off the premiership contention perch, the next thing to think about (for better or worse) is what will happen in the trade period and the draft. 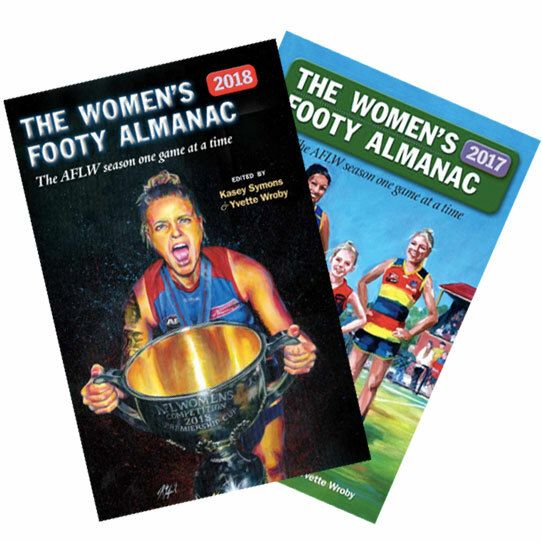 Sure, you could spend your free time reading a good book (here’s a great one: the 2018 Women’s Footy Almanac), catching up with family and friends, or communing with nature but where’s the fun in that? In years gone by, drafts were fairly straight forward – picks would be allocated from that year’s rubbishest team to the premier, some trading would occur, and they’d cycle through until all their lists were full of fresh meat. However, with the introduction of Gold Coast and GWS, zones and academies, father/son bidding and the trading of future picks, the draft has become a lot more complex. 2018 will supposedly be a superdraft (which despite its name is not a terrible new beer marketed by a young man with an unconvincing moustache and even less convincing vernacular), so your club’s position leading into it perhaps carries more importance than in previous years. Let’s look at where the teams are currently positioned and see who has the strongest hand heading into this year’s trade period/draft. The following table shows the 2018 draft picks each team currently has in hand (red numbers are still dependent on final ladder positions of the top six). It then uses two systems of valuing draft picks (the AFL’s salary-based Draft Value Index (DVI) and Hurling People Now’s (HPN) player performance based Draft Pick Value (DPV) system) to rate the comparative strength of their draft hands. 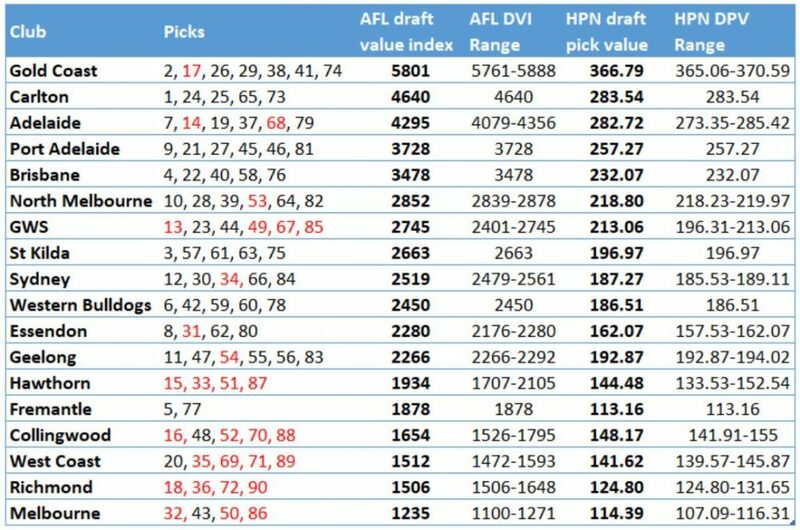 In short, the AFL rates high draft picks comparatively more highly, while HPN rates down to the fifth round of the draft and places more value on lower picks than the AFL does. As a result, HPN’s system will consider a team with more picks more favourably than the AFL’s system does. The range columns show the range of potential outcomes on the two systems pending the outcome of the finals. Gold Coast have by far the strongest hand heading into this year’s trade period / draft. With their own and West Coast’s first round picks (received as part of a swap of picks last year), Essendon and Geelong’s second round picks (for Adam Saad and part of Gary Ablett respectively), the Suns have another opportunity to load up with top end talent or trade in some good experience. As always for Gold Coast, retention will be the issue. The Suns will be hoping West Coast loses their prelim to bump up that first round pick (in the event that West Coast finish fourth, Pick 17 becomes Pick 15). Carlton, while second the AFL DVI ladder, only just shade Adelaide on the HPN DPV ladder. They have Pick 1, but Adelaide have their second and third round picks (courtesy of the Bryce Gibbs deal) and Geelong have their fourth. Such is trading with future picks – you are gambling on having a good season and your trading partner not. To balance this out, the Blues get reasonable value out of Adelaide’s and the Western Bulldogs’ (pick swap) second round picks but then have to wait until the fourth round before using Geelong’s pick (as part of the Darcy Lang trade). Of course, between now and then the Blues need to work out a trade for at least Mitch McGovern, they will be happy to head into the trade period with a fair amount of currency. Speaking of Mitch McGovern, Adelaide has obtained a very strong hand in this post-season. A poor 2018 combined with the outcomes of the Gibbs and Jake Lever trades last year see the Crows with two first round picks and the first pick in the following two rounds. The Crows will be hoping Melbourne and Collingwood lose this weekend to get best value out of the Demons’ first and fourth round picks. All the talk in Adelaide (well, not all of it) is whether the Crows can trade their way up to Jack Lukosius or Izaak Rankine with the hope of holding onto some top level home-grown talent (Connor Rozee is also having an outstanding SANFL finals series for North Adelaide). I reckon the desire of SA clubs to recruit local players is almost always overblown at this time of year (in the last 10 drafts the SA teams have used their first pick on a South Australian seven out of 20 times). Staying in Adelaide, the Mudholians also figure prominently on this list, featuring comparatively strongly in the second and third rounds. Port Adelaide go into the post-season with their own picks in the first three rounds as well as St Kilda’s Pick 21 (as part of a pick swap – both the AFL and HPN think Port came out ahead). The Power also hold North Melbourne’s Pick 46 coming from another pick swap last year. They too may wish to move up the draft order and chase some South Australian talent this year (see earlier comment), particularly with Jared Polec out the door. If so, they’ll have to do a bit of fancy footwork at the trade table to get high enough in the draft. They’re building something up Brisbane way and they will head into the post-season period with all of their own 2018 picks and none of anyone else’s. Quite boring, really. North Melbourne are another well placed in the middle of the draft with St Kilda’s and West Coast’s third round picks at the expense of their own. Their limited interest in the finals would be for West Coast to go out in the preliminary final to marginally improve their third round pick. GWS are the highest ranked of the finalists draft wise, depending upon the outcomes of the finals, of course. It is worthwhile noting, however, that Pick 13 would be the Giants’ worst first draft pick ever. GWS also have Fremantle’s Pick 23 (Nathan Wilson trade) and Essendon’s Pick 44 and have sent their second round pick to Essendon as part of the Devon Smith trade. Given their terrible year, St Kilda aren’t particularly well positioned heading into the post-season. After Pick 3, at this stage they will need to wait another 54 picks before re-entering the draft with their fourth round pick. Their second and third round picks sit snugly in the palms of Port Adelaide and North Melbourne following the Logan Austin and consequent trades. Gee, the Saints would want to get that Pick 3 right! Sydney go into the post-season relatively conservatively, having all but one of their original picks still in hand. The only change is having traded away their round three pick in return for Collingwood’s round two pick as part of the Sam Murray trade. It probably seemed a better deal at the time for the Swans, but it does move them up the draft order, the final distance depending on the outcomes of the finals. They need to make sure they have sufficient points to match any bid for Nick Blakey, so will need to keep a variety of draft picks in hand. The Western Bulldogs are another that, following a poor season, have left themselves a little shallow in the 2018 draft pool, spending a fair amount of time trading picks in 2017 to land Josh Schache for the right price. In a way they have the worst of both worlds – the Bulldogs finished 13th but were a long way behind 12th placed Adelaide. They also go in without their second round draft pick, having traded it to Carlton last year as part of a swap of picks (now that we know the value of that pick, by the AFL’s system the Bulldogs essentially gave Carlton Tom De Koning for free). Essendon went big at the trade table in 2017, so it’s not surprising that they enter the 2018 post-season a tad light-on. Other than their own first round draft pick, those Windy Hill types are waiting to see what GWS’s second round pick might be worth (via the Devon Smith trade) before they re-enter with their own pick in the fourth round. Meanwhile, Gold Coast and GWS will see what they can do with the Bombers’ Picks 26 and 44 respectively. Depending on where GWS end up, by the AFL’s DVI, Essendon have paid the equivalent of Pick 50 for Devon Smith (more like Pick 85 according to Hurling People Now) – they’d be very happy with that. At this stage of the ladder, we’re mostly into the finalists and Geelong can now worry about the draft. They currently sit 12th on the AFL DVI ladder but ninth on HPN’s due to their weight of picks. The Cats hold their own first and third round picks as well as Richmond’s third round, and Carlton and Gold Coast’s fourth round picks as part of the Darcy Lang and Gary Ablett trades. I’m not sure how useful it is to have four picks between 47 and 56, so you imagine Geelong might feature at the trade table as has been their wont in years gone by. Despite media analysis over the weekend, using all of their picks on young talent doesn’t seem sensible unless the Cats can trade their way to fewer, better picks. Hawthorn will enter the post-season slightly light-on, having traded away their fourth round pick as part of the Jarman Impey trade. If the Hawks hold their current ladder position, according to the AFL system, they will have effectively traded Pick 28 for Impey (more like Pick 16 according to HPN). Given his usefulness this season, they’d be happy with that result. Ok, now Fremantle. It’s hard to fathom that a team that is struggling so much enters this post-season with the 14th ranked AFL DVI draft position and the bottom ranked according to the HPN system. In the last trade period, the Dockers parted with their 2018 second, third and fourth round picks basically for Nathan Wilson, Brandon Matera, Lloyd Meek and Scott Jones. With the exception of Pick 5, Fremantle have opted out of this year’s draft. If the Dockers’ claim that they are not looking to trade players out is to be believed, it could be a quiet trade/draft period, shy of shifting some 2019 picks to get back in the game (insert ill-considered ‘they should trade Fyfe’ opinion piece here). Collingwood enter this post-season with the hand of a team that finished in the top four. As they have five picks, HPN’s system (12th) rates the Magpies more highly than the AFL (15th). Currently, the Pies hold their own first, third, fourth and fifth round picks and have shipped their second round pick to Sydney as part of the Sam Murray trade that also saw them land Sydney’s third round pick. As it currently stands, Collingwood has effectively paid Pick 54 for Murray, whereas HPN’s system suggests they essentially got him for free. Given the current kerfuffle, it may very well be the Swans that got the better end of that deal after all. Moving ever closer to the top of the real ladder, we have West Coast, whose first round pick has moved to the Gold Coast (along with last year’s Pick 50) as part of a trade of picks that saw them land Gold Coast’s second round pick (as well as last year’s Picks 21, 26 and 37). Currently, the AFL and HPN’s systems have the Eagles making a killing on that deal (equivalent to Pick 6 or Pick 4 respectively) and, even if they go out in the preliminary final, West Coast still end up way, way ahead. Even better, the Eagles have gotten a year into Oscar Allen (two games), Liam Ryan (11 games) and Jack Petruccelle (three games) through the deal. For Gold Coast, at the time to describe this as a “coup” is more than a tad embarrassing with the benefit of hindsight. At least they have somewhere for their chickens to live. And next, Richmond, the all-conquering, eat ‘em alive, yellow and blacks. Richmond did very little with their future draft picks in the last trade period other than shipping their 2018 third round pick to Geelong for a third round pick they used the points from to land Patrick Naish as a father-son. Other than that, they will enter the post-season with the draft picks their final ladder position will dictate. I think they’re happy with the world right at the moment. And, finally, at the bottom of the post-season pecking order (which, of course, if it means you had a good season it’s exactly where you want to be) is Melbourne. The Demons shifted hell and earth to get their hands on Jake Lever last year and consequently enter the 2018 post-season without a first or fourth round draft pick. The Lever trade does see the Demons with Adelaide’s pick 43, which is a number of places better than they would have expected when making the trade. On current ladder positions the AFL thinks Melbourne paid the equivalent of Picks 7 and 67 for Lever while HPN’s system pretty much agrees – Pick 7 and a button or two. Of course, if they (and Collingwood) lose the semi finals, this deal gets marginally worse for the Demons. No pressure, but entering the post-season with the worst first pick and overall draft position, Melbourne will have to look to the trade table if they need to refine their squad. So there you have it. Pending the outcomes of the finals, we have waded through the dismal swamps of the gambling of future draft picks to find out where your club sits going into this post-season. Who needs the actual footy when you have numbers instead? What are you waiting for? Get your copy of the Women’s Footy Alamanac now. In fact, why not get both at a bargain price! Dave, both interesting and headache-inducing. I’m struck by the increasing resemblance between trade and betting markets nowadays. The draft (along with the salary cap) are the AFL’s main mechanisms to equalize the league. I wonder to what extent recent “innovations” have helped or hampered that?